Some town races are more memorable than others, and this one, the 52nd annual Firecracker 8K in Bethel on the Fourth of July, was one that will stick in my mind. First of all, it started right downtown, with no giant high school or empty field parking lot; as far as I can tell, people just parked on one of the nearby streets (I did) or were local enough to just walk to the start. It was also the 100th race of a member of the 169 Towns group, and someone (or a small army) had gone out on the course before the start and written encouraging messages in chalk along the way. Not a few, not ten or twenty or fifty, but hundreds. 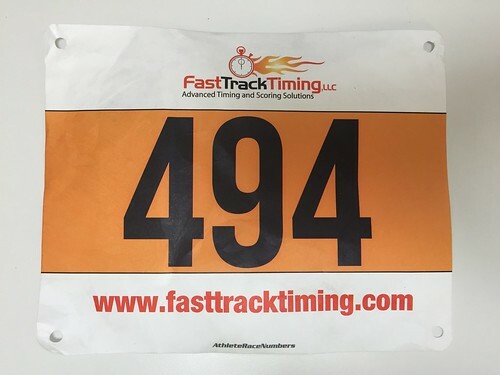 I feel like there was one every 20 feet; at one point, a guy I was running with asked his friend, “Who’s this Jackie person?” You could tell that this was one of those great, long-standing small-town races, with its unorthodox distance and its pre-race traditions. I had apparently run an 8K once before, so it wasn’t the slam-dunk PR I might have expected, but it was a fun time.